TrendSource Trusted Insight, a market research and strategic consulting firm, sought to uncover this season’s latest and most important back-to-school shopping trends. A recent Back-to-School Shopping study surveyed nearly 1,700 respondents and found that schools influence consumers’ shopping lists more than expected. Though only 41% of respondents intended to purchase electronics, almost half of them were doing so because their child’s school requires the technology. And while the basics remain the same—common school supplies appeared on 94% of our respondent’s shopping list—shoppers do not intend to merely throw a little of this and a little of that in their cart. Three-quarters of respondents indicated that local stores provide them with a list of required school supplies, and 63% of those respondents indicated they would purchase everything listed. School-mandated shopping lists did not govern one category, however—fashion and apparel, where only 17% of respondents indicated they would be shopping for school uniforms. 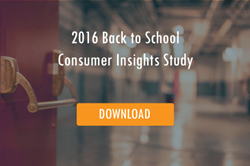 For the full results of the 2016 Back to School Consumer Insights Study, click here. TrendSource Trusted Insight provides business intelligence, customer experience insight, compliance solutions, and other market research and data analysis programs that deliver measurable ROI. With over twenty years of experience, TrendSource Trusted Insight’s customized solutions deliver high quality Customer Experience Management Programs that quantify service gaps, provide prescriptive/corrective solutions, identify trends, and provide actionable solutions through enhanced reporting and analysis. TrendSource Trusted Insight conducted this research study by surveying North American Field Agents in the MSI database between June 6 and June 19, 2016. The results represent 1,699 online respondents who opted in to participate voluntarily. TrendSource Trusted Insight has the unique distinction as a market research organization that is an ISO 9001:2008 certified company. For more information about this study, please contact TrendSource Trusted Insight at: TrustedInsight(at)trendsource(dot)com.